For DDTank experts, stop playing a few fights would make them uncomfortable. Having a challenge with others may be a good thing, but league fights will prove your skills even more! Doing league fights have become a daily task for some players. Your other skills won't be shown to other playmates, and there are no rankings to determine who is better. Because of this, the new version has offered a special function Battle Record. Want to know how strong you and your league mates are? Then start to battle! Other than showing of your skills, according to the number of wins you get, the system will send out free gifts like Energy Stones, Synthesis Stones, random Card Box, random Junior Pieces and other special items. All these items will be sent out once a week when the Hall of Fame is updated. The higher the score, the better the rewards! The best team will even gain a special reward——a 1 week's temporary weapon: Ares! +12 strength, full +50 synthesized, SLV4 Repeat, SLV4 Harm, Dante SLV2 Harm, all in 1 golden axe! Mystic weapon is what a champion deserves! Wield it, and let everyone stare in envy! Want to have the weapon forever? Then join in the battle and defeat other competitors. Only then can you be worthy of the axe Ares! To participate the battle is easy! 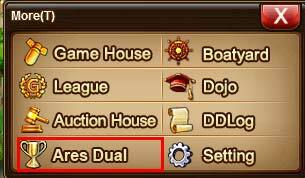 Every Monday to Friday 19:30-21:30, participate in 2V2 free fights. Your scores will be recorded. 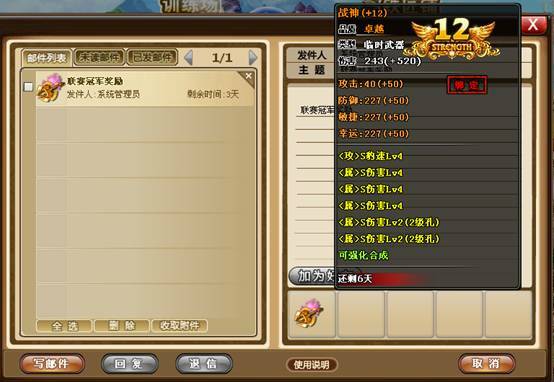 Remember, only players that are lv20 or above can take part(includes lv20) and be eligible for the prizes. Players with lower levels have to train yourself a bit more. More information and rules can be found at the newly added function stated below. 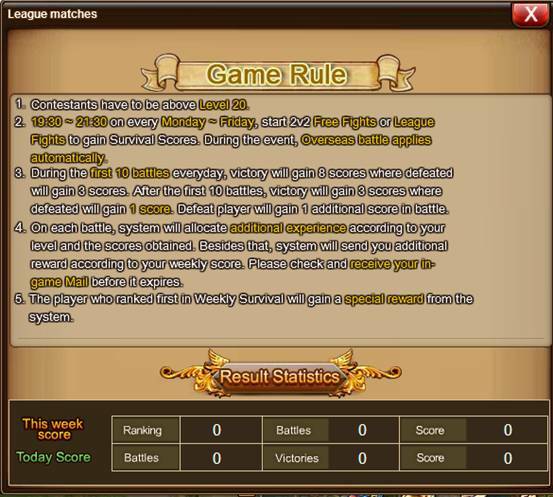 Click the button, and you will be able to read all the rules. The higher the score, the better the prizes. Big prizes are waiting ahead! Go take part now!